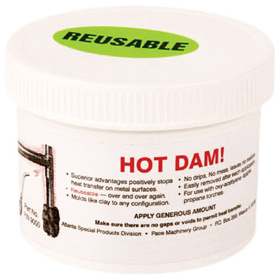 When You Need to Stop Heat COLD, Count on HOT DAM! Hot Dam Heat Stop Compound completely stops heat transfer down ferrous or non-ferrous pipe. Easily molds like clay to any shape you need. It can be used over and over and removes quickly and cleanly after each application. No drip, mess or residue. Ideal for applications in Hot Tapping, Welding Pipe, Soldering Copper Tube, Commercial Pipe Freezing, Plumbing, HVAC, Jewelry Fabrication, and Electronics soldering. Simply stores in a 3/4 lb. container. Completely stops heat transfer down ferrous or non-ferrous pipe.